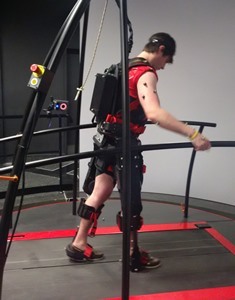 Dr. Edward Lemaire and his research team have been awarded a $670,000 VIP II grant from the Ontario Centres of Excellence to evaluate and develop the new ARKE exoskeleton, in partnership with Canadian company Bionik Laboratories Inc. This wearable robotic suit is designed to help people with spinal cord injuries or lower extremity weakness walk. This exploratory study will evaluate ARKE use within a physical rehabilitation environment to improve physical capacity for people with spinal cord injury and then use this information to refine ARKE so that it is ready for everyday use.